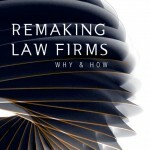 With today’s post, Review of Data-Driven Law, we welcome Colin S. Levy as a Contributor to Dialogue on Remaking Law Firms. Hailing from Boston, Colin adds to the ranks of corporate counsel in our line-up. Review of Data-Driven Law commends a new book to lawyers who need / want to understand how ‘numerical analysis in the practice of law can result in lasting and meaningful outcomes’.